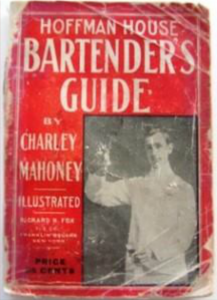 Written by Charles S Mahoney, head bartender of New York’s landmark Hoffman House, The Hoffman House bartender’s Guide gives you a more than ample taste of the cocktail’s golden age in the US during the turn of the century. The Hoffman House was the training ground for such luminaries as Harry Craddock. Photographs of the Police Gazette‘s annual bartending competition and of some of American’s most famous watering holes makes this volume an inspirational journey back through time. What did bars operated in New York by Jerry Thomas and Harry Johnson look like on the inside? They were true spectacles: shrines to drink and art. To attract customers, the better places lined their walls with art that now hangs in some of the world’s top museums. Bouguereau’s Nymphs and Satyrs once hung among many other paintings in the Hoffman House. Its proprietor Edward Stokes paid $10,010 USD for it at the time, or roughly $250,000 USD in today’s currency: a fraction of the painting’s current value. Both Thomas’s and Johnson’s personal art collections were reputed to be massive. But we digress. Hoffman House was equal to Delmonico’s in stature back in the day. An 1893 race between the waiters from the Delmonico’s and Hoffman House restaurants, and those from Cafe Savarin took place in 1893, with each waiter carrying a Manhattan cocktail on a silver tray. Though only the winner got a prize, all competitors got to enjoy their cocktails after the race. But the cocktail was moving a lot faster than a sprinting waiter. By 1895, Manhattans were being served in Japan, Korea, and the Straits of Magellan. According to Savoy legend Peter Dorelli’s findings in the UKBG newsletters from the 1930s, the young Harry Craddock worked his way from the Hollenden Hotel in Cleveland, Ohio, in 1892, to the Palmer House in Chicago the following year, before taking his post at Manhattan cocktailian hang-out, Hoffman House Hotel: all before joining the esteemed staff at the Knickerbocker Hotel near Times Square at the turn of the century. He found a bar boy job in the old Earle’s Hotel on Canal Street, squeezing lemons. He became a bartender at the Hoffman House Hotel. He became part-owner of the Pabst rathskeller, which stood on 42nd Street between Broadway and Seventh Avenue (the spot where the ball drops every New Year’s Eve). He made the acquaintance of so many wealthy businessmen that when he decided to open his own bar, he simply turned to his best customers to find investors. After a few successful years as proprietor of the Woodmansten Inn in the Bronx, he received an invitation to return to Manhattan. One of his customers, John Jacob Astor was opening a new hotel and proposed that he manage it. On his way to becoming a multi-millionaire himself, Regan went a step further, taking on the Knickerbocker’s lease. And he brought old colleagues like Craddock to work there.